Elections of any significance occur every two years (mid terms) and every four years (Presidential) with the most significant being (predictably) every 8 years when the current, cabal controlled puppet has served their two terms and must leave office. (A phenomenon that may be expounded upon in a future report). So every four years we gather around the TV sets after the polls close and watch the drama of the election unfold as the MOP gives us the results while they interview a multitude of experts between their “calls” of winners of the states and running tallies of the electoral scorecard. As entertaining as a sporting event and what’s even better, you can pick your announcers depending on your political bent and preferences. 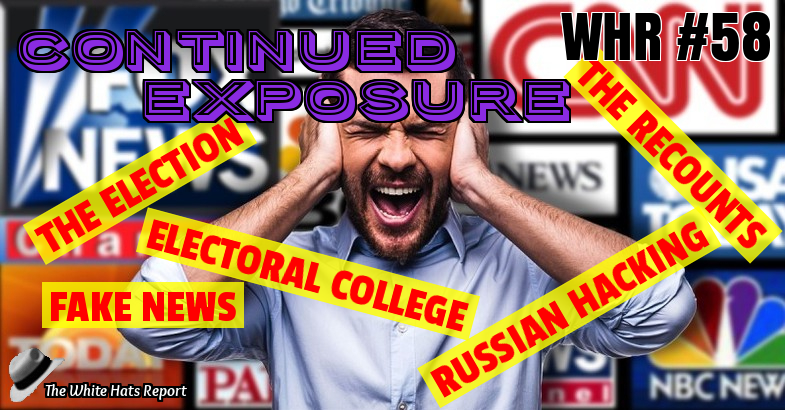 As the map gets colored blue or red, has it occurred to anyone why the networks of propaganda are the ones who have been tasked with determining the election results? Isn’t it interesting that we aren’t getting results from the FEC (Federal Election Commission) or the Secretary of State’s office for each state? What massive computer tabulates the tens of thousands of polling places (precincts) across the USA? How do they get the % "in" or "counted" when they don’t know how many votes were cast until they count them? When they do "call a state" for either candidate, how can they do it when only a small % of the votes are in? Jill Stein’s attempt to gain favor with the Clinton Crime Family failed after Wisconsin completed their recount with Trump gaining over a 100 votes. The recounts in Michigan and Pennsylvania were denied due to the requests being what they were, frivolous and without merit, according to judges overseeing lawsuits regarding same. It wasn't a coincidence, as we mentioned in our last article, that the three states Stein filed in for a recount were considered paramount to Trump gaining enough electoral votes to be president. We can only wonder how Clinton surrogate Stein will be repaid for her incompetent efforts. Even in interviews, Stein was far from convincing and at times, seemed to be disingenuous and defensive, perhaps for good reason. 1) Clean up the voter registration rolls, deleting deceased, illegal and out of state voters. 2) Outlaw all electronic voter machines until clear, easy and verifiable audit trails can be established. If not, get rid of all of them. 3)Require a photo ID for all elections for Federal office. If states wish to allow illegal aliens and unregistered voters to cast ballots, so be it, but not on the Federal elections which affect all of us. The constant complaining by the MOP about the irrelevant results of the popular vote have morphed into a psyop targeted at the state electors who make up the Electoral College after the failed recounts in Michigan, Pennsylvania and Wisconsin. Led by the daughter of Nancy Pelosi, some electors are seeking an intelligence briefing that will never happen on evidence that Russian hacking resulted in Trump winning the election. This push began when the MOP's star shills, the Washington Post and the NY Times ran stories citing unnamed "senior administration officials" as the source of leaks regarding Russia's involvement in influencing the election for Trump. Never mind that NO ONE has connected any hacks of the DNC and the HRC campaign to WikiLeaks. Further, no one has provided solid proof of this other than innuendo and whining from the Cabal controlled MOP and their mindless minion followers in the Democratic Party. The various intelligence agencies have switched positions on this topic more times than can be counted and it should be noted they failed to even appear before Congress to testify under oath this past week to provide testimony and details of this supposed hack. Lastly, the Liar in Chief, in his final press conference (hopefully), weighed in on the subject of Russian hacking, stating he told Putin in September to "cut it out" in his last meeting with the Russian president. Let's face facts, Putin has OWNED the sissy boy in the White House for 8 years and continues to do as he wishes without concern over what Obama will do. The Kenyan is too busy drawing lines in the sand and then running away when they’re crossed. He’s more concerned with pushing gender neutral bathrooms in schools. Or meeting with members of BLM in the White House to further undermine race relations in the US. Or patting himself on the back for an anemic economy after doubling the debt to $20 trillion. Or playing golf. 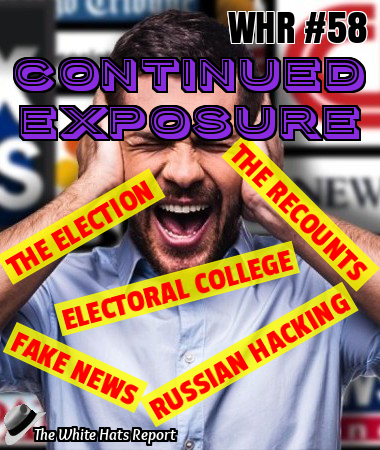 As mentioned in the Electoral College section of this report, the Cabal lapdogs in the Democratic Party and their controlled media operatives at the NY Times and the Washington Post have "leaked" information from completely unnamed "government sources" that the Russian hacking affected the election results. Interestingly enough, not one of the Agency heads, including John Brennan (CIA), James Clapper (NSA) or James Comey (FBI) have publicly acknowledged, confirmed or provided evidence or proof that this has occurred. The Agencies refused to send representatives to Congress last week to testify on the matter and it's shameful that the Liar in Chief and other government officials including the MOP have treated this lie as fact. Interestingly enough, even Clapper and Brennan, who have lied to Congress in previous testimony, will not weigh in on this subject under oath. Ironies too, continue to pervade as Brennan was caught in a lie when he denied that his Agency was hacking the Senate staffers looking into the CIA’s torture methods and Clapper lied when he denied that the NSA was spying on ALL American’s emails and phone conversations. Comey… well, we know about Comey so all this chatter about Russian hacking is baseless. Notice the reasons cited for not briefing Congress on the matter is because "the review isn't complete". If the review isn’t complete then how is the conclusion of the review already determined? This ploy is obviously aimed solely to convince enough Electoral College voters to either change their vote or cast it for someone other than Trump. They are all complicit in this fraud, both sides of the aisle, and they will continue to ignore this issue and run out the clock until January 20. Sheriff Arpiao stated he had more "sensitive" information that would not be released; most likely it includes the social security number fraudulently utilized by the occupier of the White House. We can only hope when the Kenyan leaves office and is no longer afforded the protection of the office of President that the new Justice Department will pursue him with vigor. Portland, Oregon continues to be the example of deception of the liberal Democrats in this country as reports of a Christmas party where a piñata created to resemble Trump was hanged in effigy and attacked with a baseball bat while party goers yelled "lynch him!" Predictably, this has not been reported in the left-wing liberal newspaper, The Oregonian, nor has any MOP site disclosed this. It’s become apparent that the party of inclusion and tolerance is actually the party of haters and violence. If this had happened in December, 2008, it would've been reported as what it is, racism, and blasted all over the evening news and calls for hate crimes to be established or used against the perpetrators would’ve reached a fever pitch. But since it happened in Oregon and was instigated by the sore loser liberals, not a peep. We could write books on the pathetic and treasonous tenure of Harry Reid but we’d have to interrupt our celebration of his retirement from the Senate to do so and the effort would be redundant. However, his retirement party brought out Hillary Clinton to speak and what did she talk about? Yes, fake news. While Democrats were nostalgic about Harry’s retirement and Republicans were celebrating, Hillary couldn’t resist her moment in the limelight to caution us about fake news and "malicious false propaganda". Admittedly an odd subject to be discussing during a retirement party for a colleague but when you’re about to be exposed for the satanic rituals and pedophilia you engage in, you take every opportunity to debunk the truth and attempt to throw the dogs off your trail. Megyn Kelly has emerged as the MOP's newly appointed Queen of Disinformation as she ran an interview last week of Comet Ping Pong owner James Alfantis, utilizing her weak talents and unconvincing rhetoric to confer sympathy on Alfantis, this poor business owner who has fallen victim to fake news. As the Cabal gets more and more desperate to derail the oncoming train called justice, more and more of their puppets will surface and reveal themselves. The times of exposure continue.